At the Agency for International Development, the chief financial officer is hoping that 13'the number of years AID has been building a new financial system'is a lucky number. Michael T. Smokovich, who came aboard as CFO last February, said he has one goal: Get a working financial management system in place. The agency is on its fourth iteration of the New Management System (NMS), and Smokovich acknowledged that the task of revamping the agency's financial system is daunting'especially because federal agencies have a less-than-stellar record of implementing such systems. 'We need to get things fixed and get them fixed in such a way that we can move ahead,' he said. 'We've got to do this,' AID chief information officer Richard Nygard said. Many agencies are in the same boat. The situation at AID 'is not untypical of what has happened at other agencies in terms of their attempts to implement new systems,' said George Stalcup, associate director of Defense financial audits for the General Accounting Office's Accounting and Information Management Division. Financial systems are critical because they provide agency executives with necessary data about operations. But such systems have taken on additional importance as agencies use financial data to measure performance, as required by Congress under the Government Performance and Results Act. In many ways, AID's efforts on NMS are an example of how not to implement a core financial system. In a January 1999 report, Major Management Challenges and Program Risks: Agency for International Development, GAO detailed AID's systems problems. 'The lack of an integrated financial management system and the existence of material control weaknesses hinder the agency's ability to produce auditable financial statements,' GAO said. AID has been through three failed systems rollouts. Now, after having spent five years and $100 million on the custom NMS, AID is dumping the system in favor of a commercial product. AID has set a series of deadlines to move to new accounting and financial systems. Smokovich said that the decision to move away from NMS, a system that has been troubled nearly from the start, was one of his first acts after coming to AID last year. 'In the mid-1990s, we tried to do our own thing,' Nygard said. During the past 20 years, AID has developed three accounting systems, none of which met expectations. The agency 'has reported material weaknesses in its financial systems since 1988,' Smokovich said. NMS, the most recent effort, has been 'less than ideal,' he said. The system'modeled on an enterprise resource planning approach'has been plagued by problems, delays, cost overruns and large error rates, he said. 'The ERP aspects were never realized,' Smokovich said at a recent Federation of Government Information Processing Councils conference. Through NMS, the agency aimed to consolidate AID's primary information systems into a single integrated network. Nygard said the NMS was designed to integrate four areas: financial, operations, budget and procurement. 'We found that, much to our chagrin'despite good intentions and a good concept'we are a wonderful international development agency but not a wonderful software development agency,' Nygard said. AID deployed the first iteration of NMS in 1996 but had not tested it sufficiently, Smokovich said. By April 1997, problems forced the agency to suspend use of NMS for most administrative functions at AID overseas missions. That left AID's Washington office and its field offices using different systems. 'NMS is only partially functional and has created problems in agency operations,' the GAO report said. ''In a report last March, the AID Inspector General's Office said one factor contributing to NMS problems was that AID had taken shortcuts to get the system into production. '''Based on its experience with NMS, AID has committed to follow disciplined practices in order to not repeat those mistakes,' said the report, Audit of USAID's Progress Implementing A Financial Management System That Meets Federal Financial Management Improvement Act Requirements. The IG's report concluded that in planning and developing NMS, AID had failed to implement an agencywide systems architecture, develop a comprehensive acquisition strategy and correct organizational shortcomings'all of which hindered its efforts to improve financial management. 'To purchase the core financial system before completing an agencywide architecture and acquisition strategy, and without a strong program office, creates significant risks,' the report said. Smokovich said he has taken some 'serious remedial action' to fix the problems highlighted in the report. 'Our highest priority was to get accountability and to get control over the funds,' he said. A critical first step, Smokovich said, was an agreement between himself and Nygard that they would work together. 'The CIO and I have a rule: We cannot disagree,' Smokovich said. What they agreed on first was that AID had to replace its accounting systems with something that worked. To that end, AID decided to seek help from the General Services Administration's Financial Management Systems Services Center. AID and GSA defined the baseline as-is condition of the agency's financial management and the to-be requirements, Smokovich said. AID also hired IBM Corp. and PricewaterhouseCoopers Inc. of New York to conduct an independent study of the agency's financial requirements. The study recommended that AID replace NMS with a commercial application. To help integrate some of the existing systems and to prepare systems for 2000, AID hired Computer Sciences Corp.
Then in September, based on its revised requirements, AID selected Momentum Financials from American Management Systems Inc. of Fairfax, Va., as its core financial application. 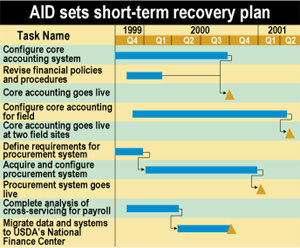 AID officials said they soon would finish the final system design requirements for implementing Momentum Financials. Nygard said AID settled on the AMS package because it not only met the criteria established by the Joint Financial Management Improvement Program, but it was being used successfully elsewhere in government. AID plans to take the system live at its Washington office in September and at two pilot field locations in Egypt and El Salvador by next March. The full rollout is slated to end by September 2002. NMS will be phased out as the new commercial applications come online, Nygard said. 'We think we can make it if we don't change the software,' Smokovich said. One important task is to eliminate multiple hardware and operating system platforms. AID will standardize on Microsoft Windows NT for its network OS. AID has the ultimate impetus for improving financial management, Smokovich said: 'If we don't get it fixed, there are some who say we won't be around. So we do have fear as a motivation."